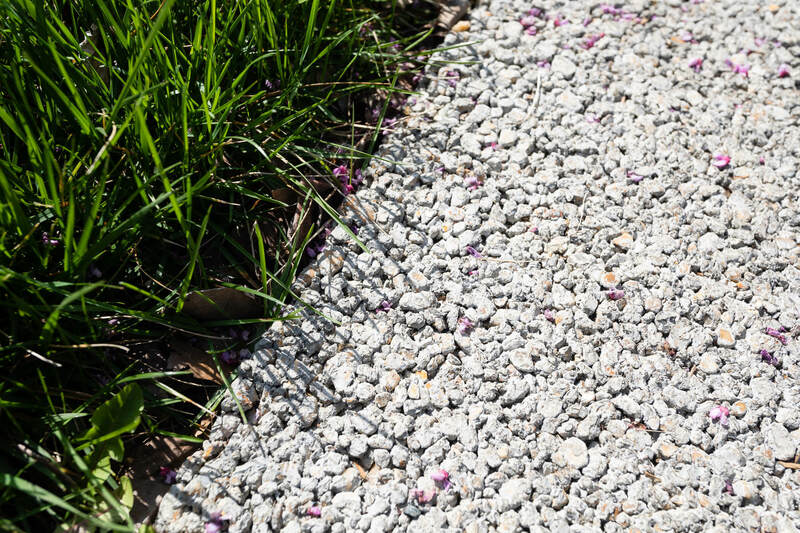 Pervious sidewalks resemble normal sidewalks but allow water to soak through. 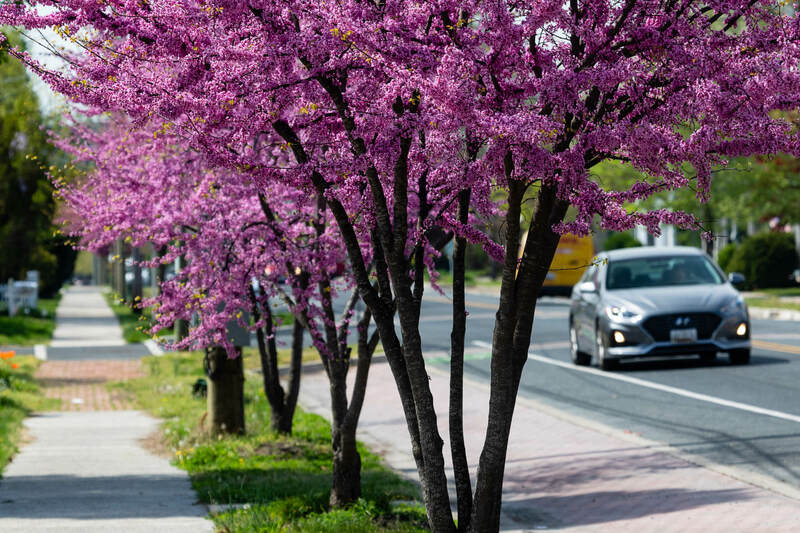 A line of eastern redbuds bloom on Maryland Avenue on April 18, 2019. Rain gardens installed mid-block along Maryland Avenue reduce the amount of paved surface that stormwater can wash across. Stormwater pollution that reaches the Chesapeake often flows from many miles upstream, so it can be hard to see its impact on the estuary. But the city of Cambridge, Maryland, lies right on the Bay and has always held a connection to the Choptank River, which is an important nursery for species like rockfish, also known as striped bass. 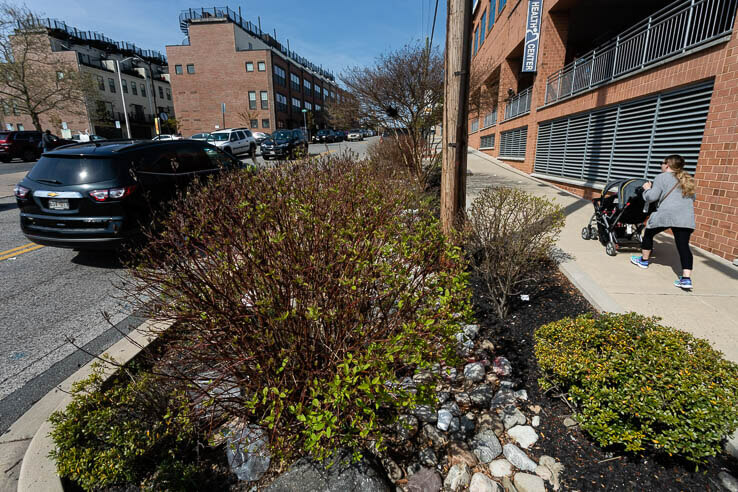 In order to manage stormwater running off its streets while providing a boost to its residents’ quality of life at the same time, Cambridge has chosen to use green infrastructure to capture pollution more naturally in structures that look like regular sidewalks and roadside planters. 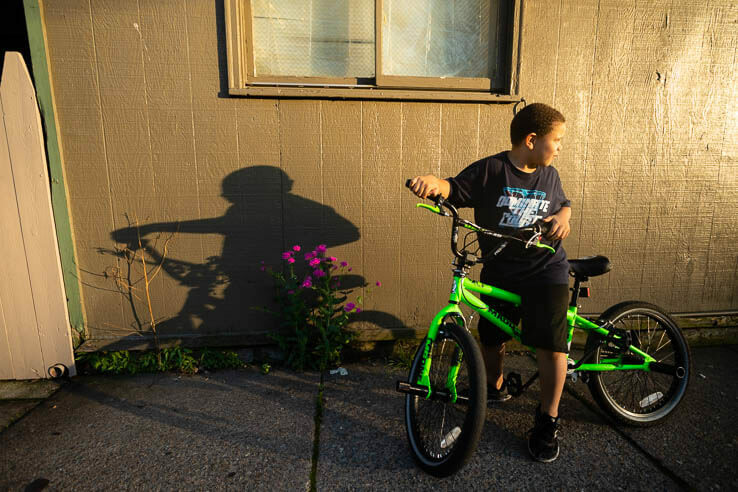 A recent effort to revitalize Cambridge began in 2011, when the nonprofit Eastern Shore Land Conservancy led conversations with residents, visitors and officials to produce the Cambridge Gateways Report. This culminated in a resolution by the city in support of redesigning and beautifying major entryways into Cambridge. One of those entryways, Maryland Avenue, connects Route 50 to the center of Cambridge, and an initial project transformed a section of the thoroughfare. 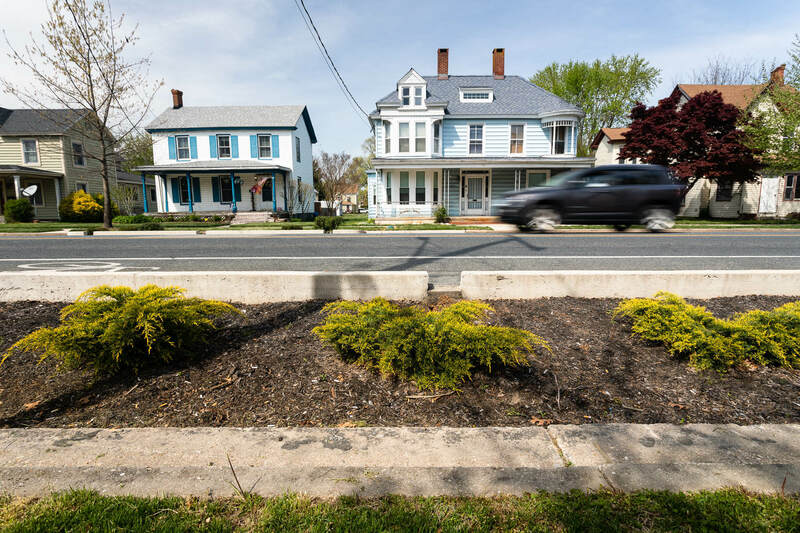 It included the installation of 12,000 square feet of pervious sidewalks, an equal area of pervious parking, new trees, rain gardens and curb extensions along 1,200 linear feet of Maryland Avenue. 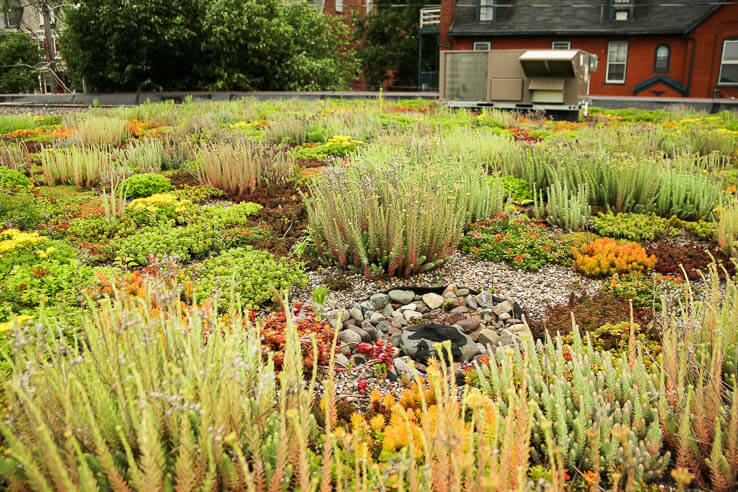 These pervious surfaces help rainwater “slow down, spread out and soak in” instead of funneling it to a storm drain. Curb extensions, along with new bike lanes, also had a traffic calming effect, requiring drivers to slow down instead of passing turning vehicles. Pedestrians also had safer, protected street crossings. 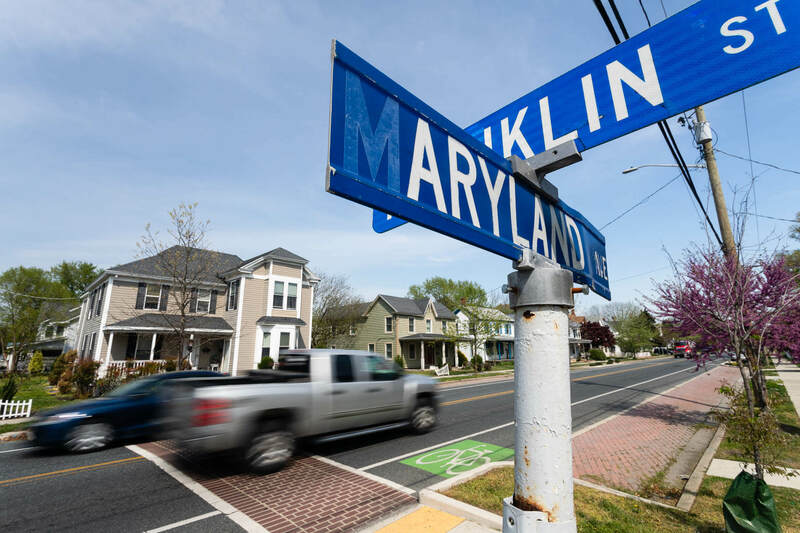 Completed in late 2015, the project has made Maryland Avenue both a “green street,” meaning it uses natural processes to manage stormwater, as well as a “complete street” designed so that vehicles, cyclists and pedestrians can all use the road together. The project was funded mostly by a grant from the Maryland Department of Natural Resource’s Chesapeake and Atlantic Coastal Bays Trust Fund, with additional funding from the National Fish and Wildlife Foundation, Chesapeake Bay Trust, Maryland Department of Transportation, and the city of Cambridge. Learn more about the importance of managing stormwater runoff. About Will Parson - Will produces digital stories for the Chesapeake Bay Program. He studied ecology and evolution at University of California, San Diego. He reported on water and the environment as a graduate student at Ohio University's School of Visual Communication, and worked at newspapers in New England before landing in Maryland.